Sandy Felton talks to Heinrich Braun of Baugaarden who creates living art and sculptures made out of willow to discover his simple and elegant designs promoting the very best of Danish design. When Heinrich Braun and his wife Mette bought an old farm with a “little bit of land” in 2002, he was given two sticks of willow as a housewarming present. 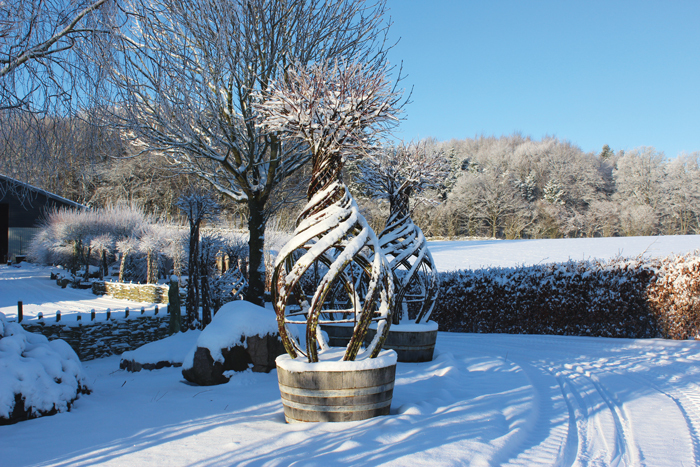 Although no one knew it at the time, those sticks were to become the inspiration for what has subsequently developed into Baugaarden Living Art based in Ringsted, Denmark. 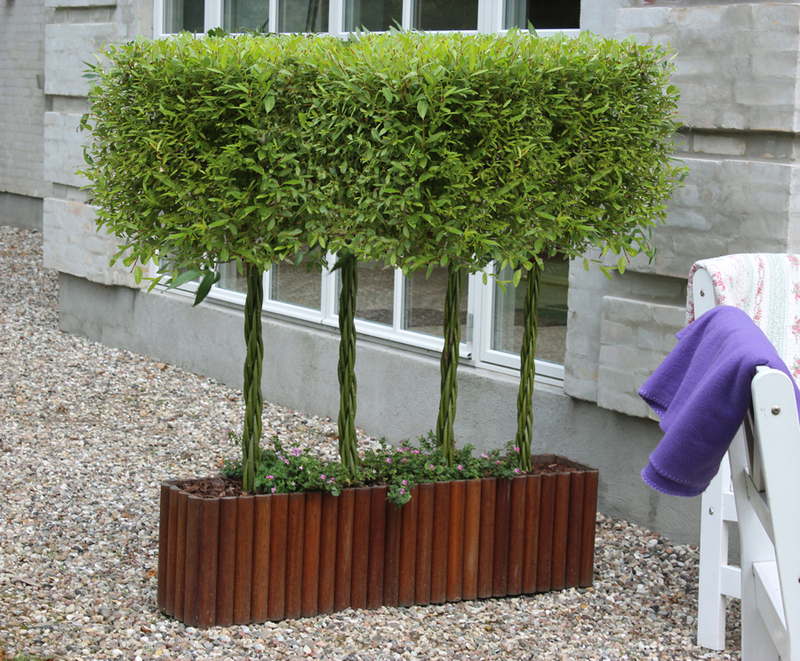 Heinrich was inspired by the simple fact that you can put willow sticks back in the ground and they will start growing. He explains that he loved the unique features of the willow and started to create some very simple designs: “Initially we wanted to weave a basket but ended up at the local city square selling living willow in pots. First I created very simple designs and then more and more complex and challenging ones,” he says. Heinrich exhibited at the inaugural Royal Horticultural Society (RHS) 2017 Chatsworth Flower Show and his style is not only distinctive but also displays the best of simple and elegant Danish design. His designs range from the simple to the complex and examples of his work can be found all over Denmark as well as abroad. He has worked on private and public commissions where his art highlights the beauty of the living willow itself which forms part of all his creations. Ask him how he gets his ideas for designs and he will tell you that they can come from many different sources: “Often shapes of other things or plant material can inspire me or input given by the specific project I am working on,” he says. “I once created a 6m tall living Eiffel tower just because I wanted to explore what could be done with 10 year old willow trees – will they burst, when you twist them, will they grow on etc – and then on another occasion I noticed a curtain pole cap that if rotated 90 degrees gave me the idea for the sculpture called Balder.” Balder is a sculpture with height and ideal for building in uplights that can be planted directly in the ground or in big wooden barrels. The sculpture ‘Thor’ came out of talks with Tivoli Gardens in Copenhagen: “I visited their garden and two themes occurred in our talks a couple of times – the onion shape and the harlequin pattern. Many hours of trial and error later, I succeeded in creating Thor thus combining the two. When seen from a long distance the onion shape also makes a harlequin pattern,” he explains. Sometimes one design will lead to another and for Heinrich the innovative and creative process is what he loves best. 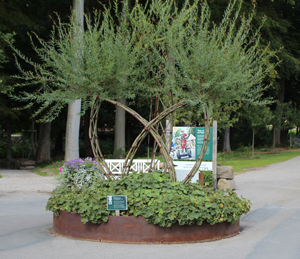 When the Count and Countess of Egeskov Castle, in Denmark, wanted to leave a personal fingerprint in the history of their garden that would survive their tenure, he came up with the idea of using their initials M and C.
Over the years he has tested quite a few types of willow and now works with five or six types that suit his needs. 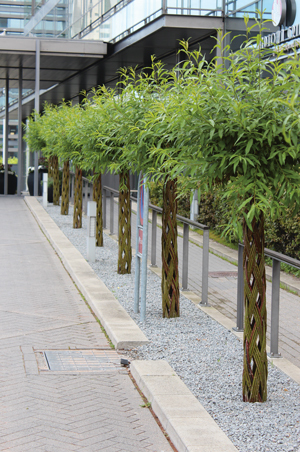 The options on willow types are endless but for Heinrich it is the focus of speed of growth (preferably slow) and the leaves, the climate that they can handle (temperature and humidity) and hardiness against fungus and disease as well as the colour of the stem. Personally, I particularly like the Harlequin design where the willow stems are woven in a weaving technique making the stems look like one tree, and when the willow grows out of the top it looks just like a palm in summer, but lasts the winters. 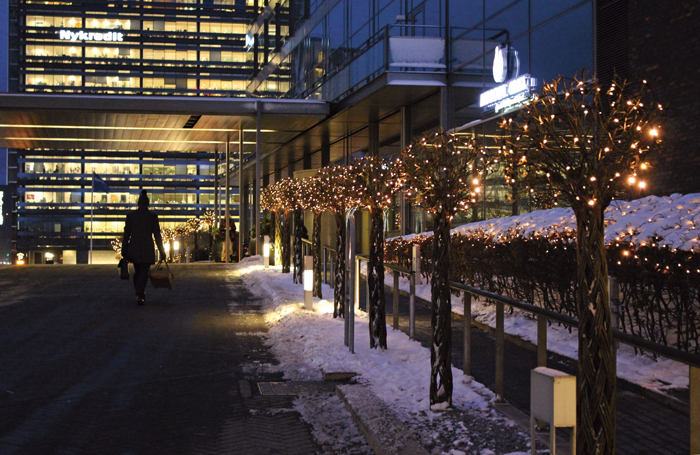 This is important in Nordic countries as they can’t have palms for the reasons of their potentially cold winters. For this design, Heinrich tires to put as many stems of willow in as little a pot as possible, the result is an all-time classic fit for the garden environment in both winter and summer. Baugaarden have exhibited at both RHS Hampton Court and Tatton Park as they find the standards of RHS Shows fits their products very well. 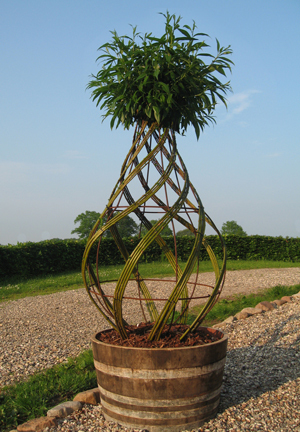 Next year they hope to have their own stand at RHS Chelsea Flower Show to show some more of their distinctive willow art and one feels sure that if they do there will be more than a lot of interest in Heinrich’s lovely designs. You get a good feel for the range of living sculpture that Baugaarden produces from a lovely book that Heinrich has just produced showing living art at its best. The book explores how fascinating willow can be and how living willow art in the garden can bring a whole new dimension to the surroundings. Mette is the other part of the duo responsible for marketing Baugaarden products, (pictured above) looking after all the marketing and PR for the company from their headquarters located at their country house near Ringsted in Denmark, where they live with their three children. They have also created a large exhibition area at the house where visitors can see examples of Heinrich’s designs. Their latest creation, ‘The Willow Wand’® (picture banner above) has recently caught the attention of the public. 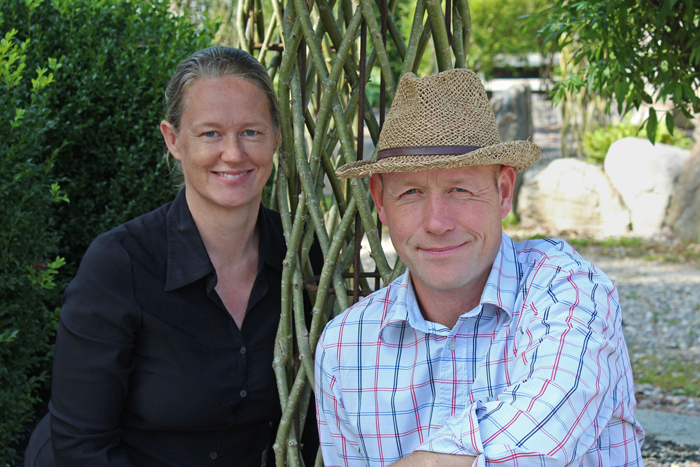 Its nine willow trees twisted as a rope that you simply just plant in the ground or in a pot and it will start growing: “You can grow them as individual trees, but you could for example make a pleached hedge with them,” says Heinrich. “We are at the moment working on plans, so the product will become available throughout the UK, made as a local product done by locals with local willow and just a twist of Danish design on top,” he adds. This of course has the added bonus of creating UK jobs and reducing transportation costs. We wish Heinrich and Mette all the best in the future and thank them for taking the time to share their thoughts about this lovely form of living art. All photographs are ©Baugaarden Living Art.